Weekend traffic to and from the mountains can be a real pain. Delays can add up to hours more spent in the car, not to mention the cost of gas. In the winter, poor conditions can make the situation even worse, even leading to closures on the high passes if the weather is really bad. The solution? Take the train! Amtrak’s California Zephyr leaves Denver at 8:00 a.m. Fridays and gets to Glenwood Springs around 2:00 p.m. At just under six hours, it’s slower than driving — though with weekend traffic, not by much — but so much easier. You can even get to Union Station via light rail from the airport, so you can plan your whole vacation without setting foot in a car! Glenwood Springs’ downtown area — and all the shopping, dining, and sightseeing it has to offer — is all within walking distance. 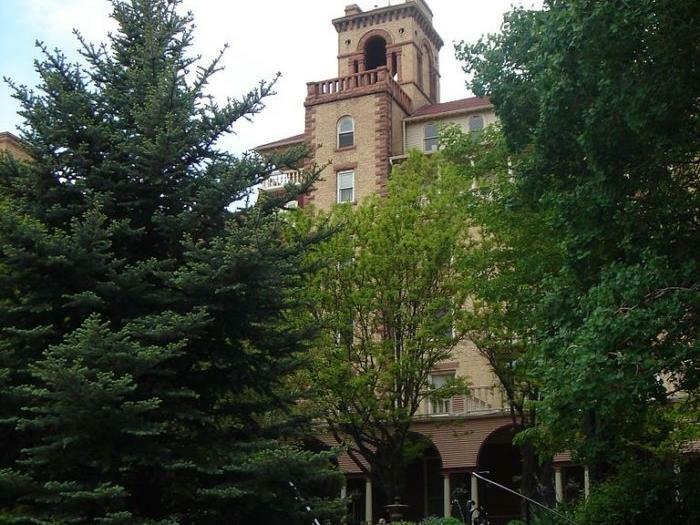 The Hotel Colorado and Glenwood Hot Springs Pool are just across the river from the train station, accessible by a pedestrian bridge, and the Glenwood Canyon Brewing Company is right across the street! If you want to venture farther, the Roaring Fork Transit Authority (RFTA) buses run all the way up the valley, to Carbondale, Basalt, and Aspen. To get around a little faster, you can rent bikes from Sunlight Ski and Bike Shop and ride all over town. If you want, you can even ride the Rio Grande Trail to Carbondale — 13 miles of paved trail on an old train track, free of cars and surrounded by beautiful views of Mount Sopris the whole way. In winter, Sunlight Mountain Resort offers world-class skiing just 15 minutes outside of town, with easy shuttle access from most of Glenwood Springs’ major hotels. There are also plenty of coffee shops, boutiques, and other shopping opportunities to occupy even the coldest winter days. In summer, the Roaring Fork valley is jam-packed with fun stuff to do — the fun doesn’t stop when the snow melts! Maybe you’d like a beautiful hike through the aspen trees, or to tear up a dirt trail on a mountain bike? If you’re into fishing, you’ve come to the right place. Out of Colorado’s 9,000 miles of streams, only 168 miles are considered “gold-medal water.” 24 of them are right here in the Frying Pan and Roaring Fork rivers. If you’d rather trade in a calm afternoon for a thrill ride, the Roaring Fork and Colorado rivers offer some of the best whitewater rafting and kayaking in the state, and Glenwood Canyon’s 16 miles of towering cliffs and beautiful waters are renowned for their beauty. You’ll need a place to stay while you’re in Glenwood Springs, and luckily, many of the local hotels offer package deals with Amtrak so you can save some money on lodging and the train! Glenwood Springs also offers a number of dining options, from romantic fine dining to casual family fare to hearty brewpubs and pizza, so you’ll never run out of options. Whether you’re looking for a casual weekend of soaking in the hot springs or a full vacation of adventure, the train is your first step to getting there.